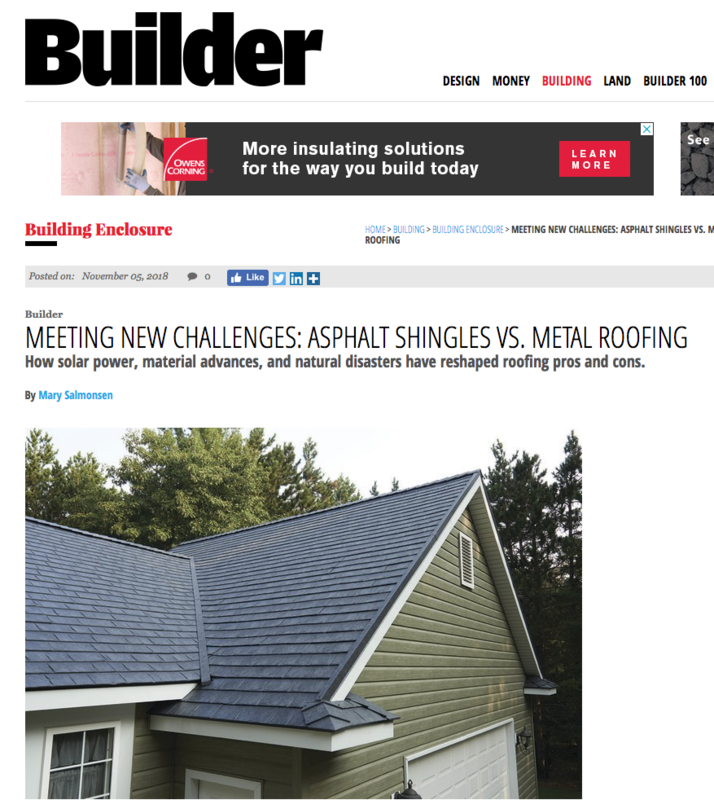 METAL ROOFING VS. ASPHALT. BUILDER MAGAZINE KNOWS THE SCORE. SEE OUR NEW BOOTH AT METALCON! 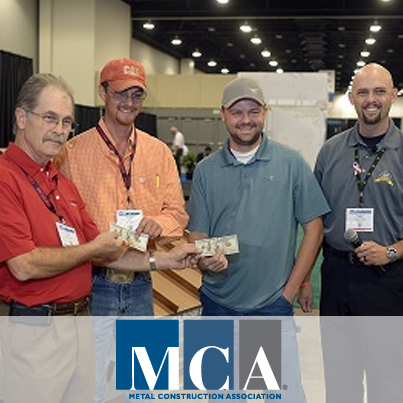 The Metal Construction Association’s booth is bigger and better than ever! Come and see us at METALCON! Using the right tools is key to getting any job done correctly. 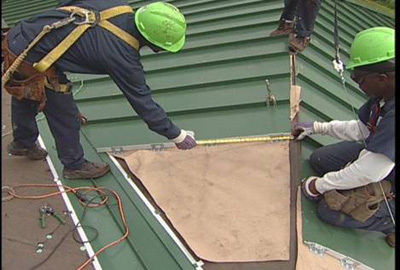 Contractors and installers who work with metal roofs know how important it is to have the right seamer or a quality screw gun. And architects and specifiers know how important it is to have a good architectural scale and the most current reference manuals. 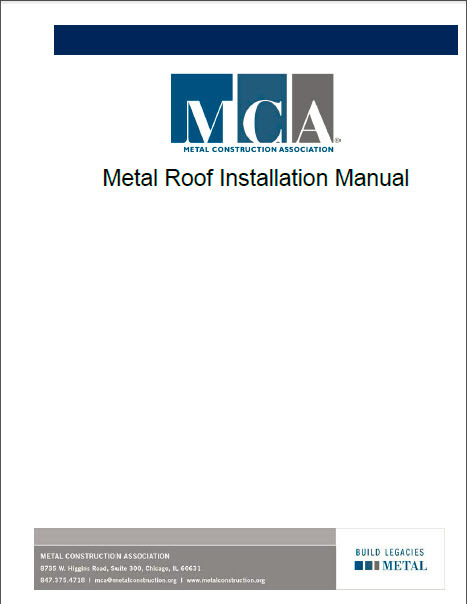 Download your copy of the MCA Metal Roof Installation Manual today, and keep the document handy as a reference as you come across questions with your metal roof project. It’ll soon become an essential tool in your toolbox. And the best part about this tool? It’s free! This week the Metal Construction Association (MCA) is hosting its 2014 Summer Meeting at the Westin O’Hare in Rosemont, IL. Representatives from metal roof and wall manufacturers, as well as suppliers, consultants, fabricators and more, will be participating in meetings to expand the use of metal roofs and wall panels. Meetings kick off Monday with the lunchtime General Session featuring a panel discussion of metal construction industry leaders. Committee and council meetings will be conducted Monday through Wednesday. We hope you enjoy your stay in Chicago! I’m getting ready to head to Las Vegas next week for the International Roofing Expo. I have to admit, I’m excited. Believe it or not (and most do not), I’ve never been to Las Vegas. 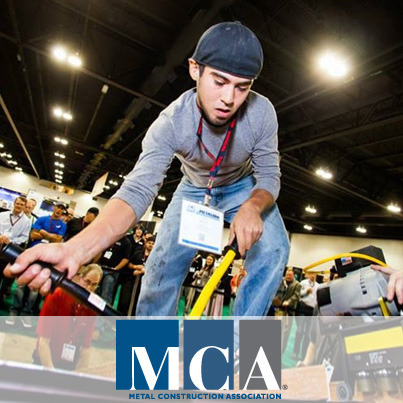 There’s no doubt that most of my time will be spent within the concrete walls of the Mandalay Bay Convention Center manning the Metal Construction Association (MCA) booth (booth #2143–stop by to say hello! ), but I am looking forward to exploring the sights and sounds of Las Vegas. One thing I always try to do before I travel to a new city for business is scope out some architectural highlights to visit. And since I work for MCA, I admit that I am always looking for real-life examples of metal construction. Here are a few examples of metal roofs and walls that I plan to see while in Las Vegas. Feel free to let us know what your favorites are! 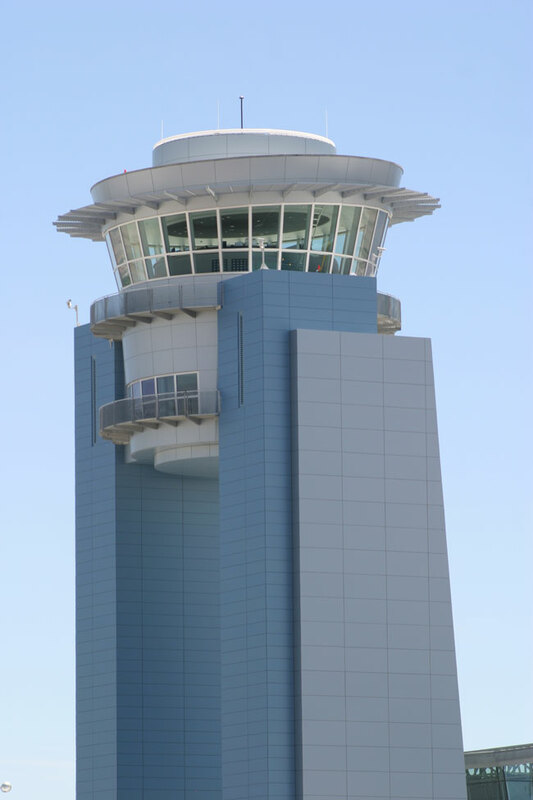 I won’t have to wait long to see an example of metal construction after touching down in Las Vegas–the McCarran International Airport recently completed an expansion project that featured Alucobond Plus metal composite material (MCM) panels from 3A Composites. 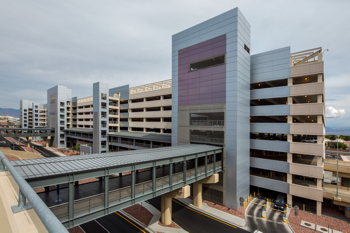 The Terminal 3 parking garage also features metal wall panels: Reynobond aluminum MCM panels from Alcoa. I’m sure the airport won’t be the most exciting part of my stay in Las Vegas, but the metal cladding will at least give me reason for pause at the airport. After a long day on the convention center floor manning the MCA booth, I can usually be found enjoying a quiet meal and catching up on e-mails back in my hotel room. But Las Vegas is all about the casinos, so I am sure I will venture into a casino or two at some point during the week. Why not try my luck with the one-armed bandits at The D Casino in downtown Las Vegas, which sports a new, metal-clad entrance from Petersen Aluminum? I’m looking forward to walking the strip–and I understand it is a long walk– to see the impressive architecture of the casinos. The over-the-top extravagance and grandiose resorts should serve as a not-so-subtle reminder that the odds are not in my favor for a big payday! Las Vegas isn’t all casinos, glitz and glamor–there is plenty for families to do and enjoy. Even though my family won’t be traveling with me, I plan to check out the Downtown Container Park for some shopping and dining. 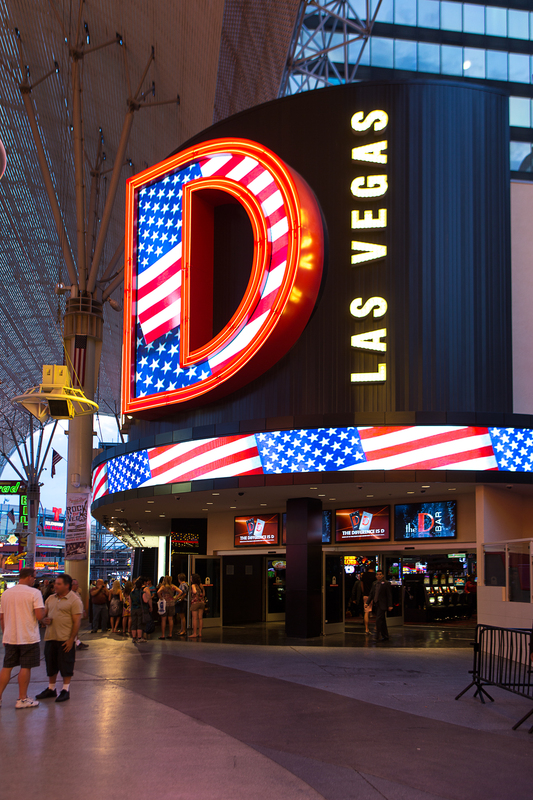 It’s located away from the main strip on Fremont Street in downtown Las Vegas. 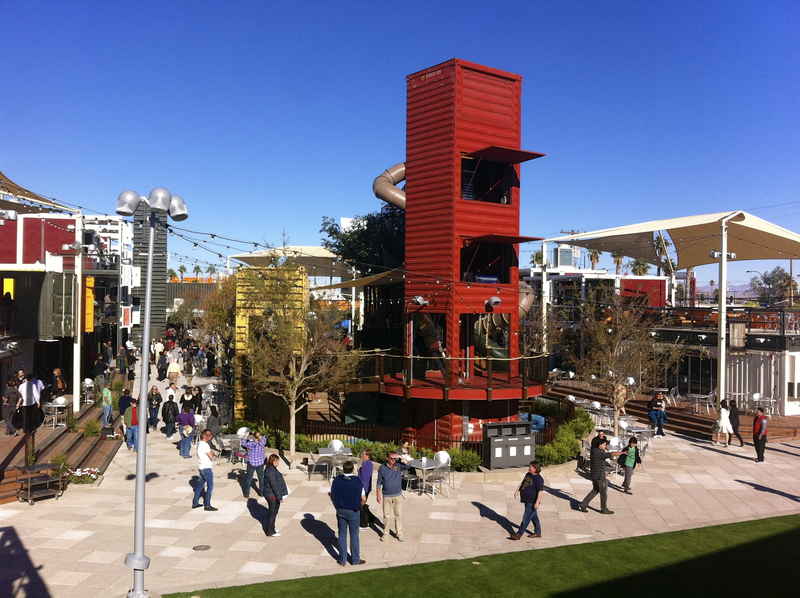 It’s just what it sounds like–a park and shopping center crafted from shipping containers. Architects and designers are finding new ways to utilize old shipping containers as structures, and this project reminds me of one of MCA’s 2012 Chairman’s Award Winners that also features shipping containers. And if I feel the need for speed, perhaps I will make my way over to the Las Vegas Motor Speedway. 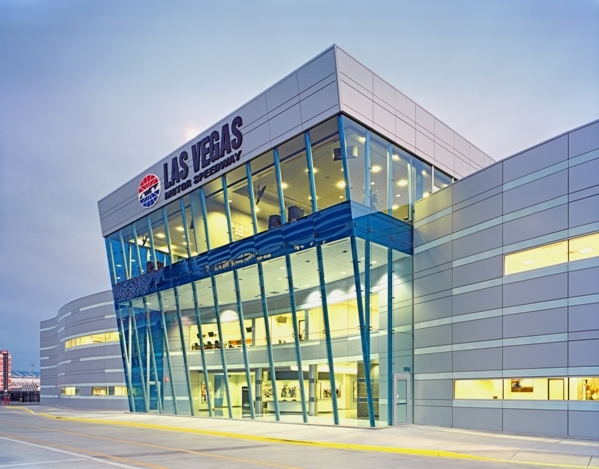 Even though the speedway’s NASCAR weekend events won’t be until the first week of March, it may be worth a quick visit to check out the exterior since it is clad in Centria’s Formawall insulated metal panels. 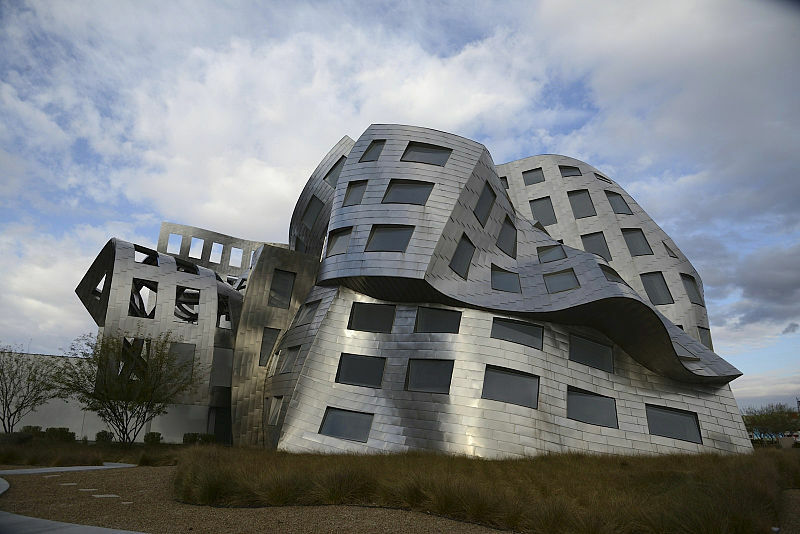 Designed by esteemed architect Frank Gehry, the Lou Ruvo Center for Brain Health (pictured at the top of this blog post) is a national resource for research and treatment of Alzheimer’s, Parkinson’s, Huntington’s Diseases, Multiple Sclerosis and ALS (Lou Gehrig’s Disease). While the design of the building has been a lightning rod for both praise and criticism, the important work being done within the stainless-steel clad walls is what’s most important. Let us know if you have any other recommendations for Las Vegas architectural highlights. 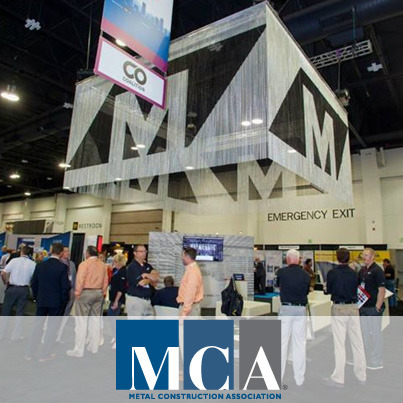 And if you are at the IRE show, we hope you will stop by the MCA booth–as well as our member’s booths–to say hello and learn about the many benefits of metal roofing. We’re excited to be heading to Las Vegas next week for the International Roofing Expo (IRE). If you’re at the show, we hope you’ll stop by and visit us in booth #2341. We’ll be at the Mandalay Bay Convention Center in Las Vegas from Wednesday, February 26 through Friday, February 28. We’d enjoy meeting you, and look forward to answering any questions you might have about metal roofing. We may know the start of 2014 down to the exact second, but the lines between old and new metal design and building materials will continue to blur well into the New Year and beyond. 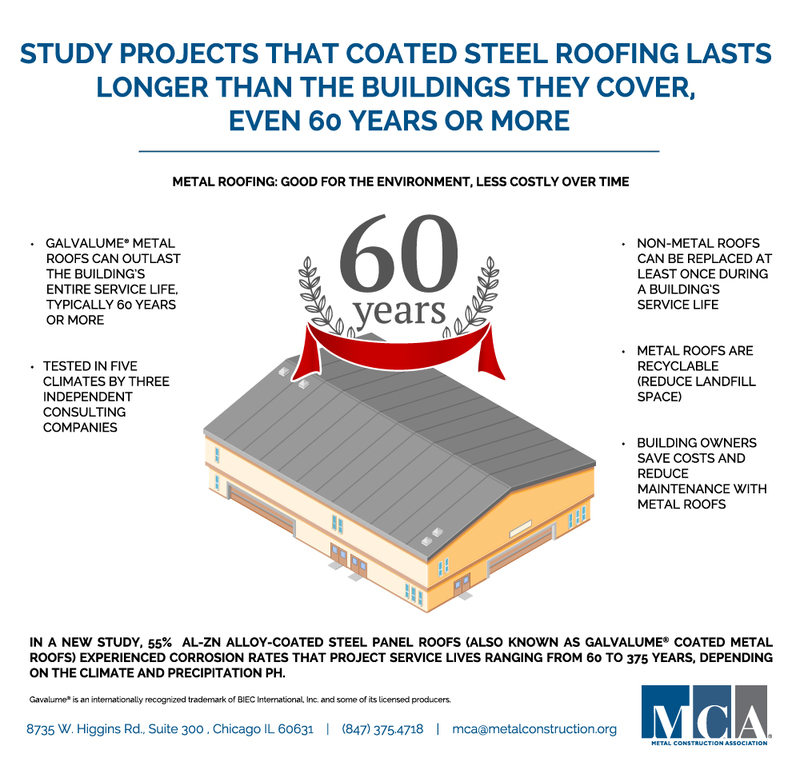 Here are two examples of how metal manufacturers are helping to redefine the true age of metal roofs in a green world. 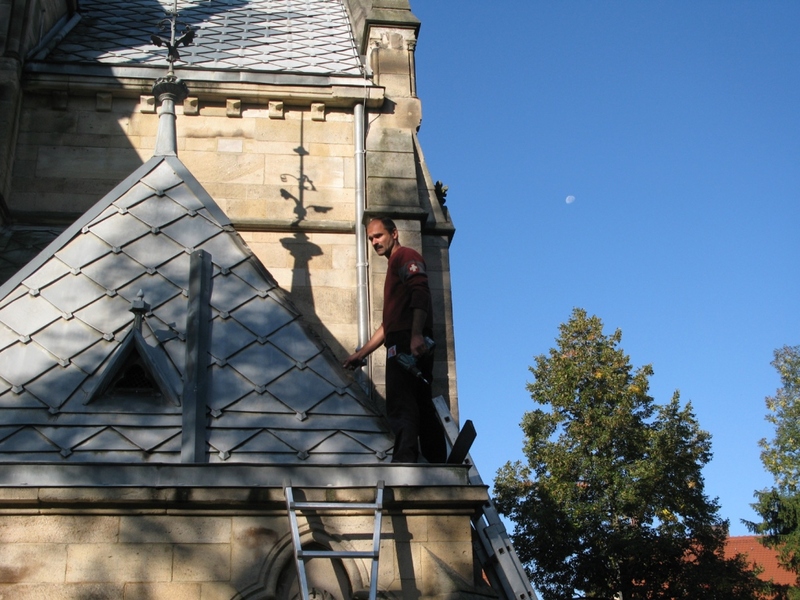 First, let’s look to Europe where 100-year-old zinc roofs are commonplace, and in particular, at the recently renovated 120-year-old zinc roof on St. Catherine’s Church in Reutlingen, Germany. This roof restoration called for dismantling and removing all the zinc tiles from the roof in order to inspect, clean, and salvage as many as possible. Tiles that were too damaged for reuse were recycled, but inspectors found the tiles that were not exposed to the main west-facing wind and weather were nearly all reusable. 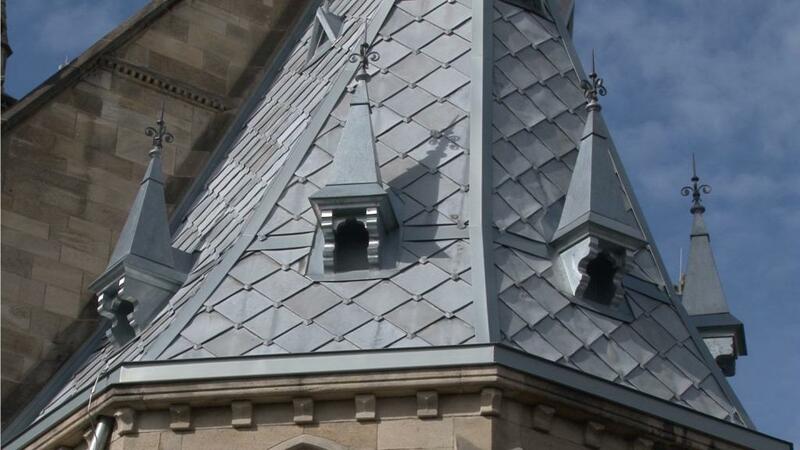 The remaining roof was re-clad with RHEINZINK 0.7mm square tiles, using 1,500 PrePATINA blue-grey 330mm x 330mm tiles. Located at the old cemetery, the Gothic Revival-style church is now preserved to its original state, circa 1890. RHEINZINK says that with the service life of zinc products expected to last 80–100 years for roofs and 200–300 years for walls, the roof tiles will be around for New Year celebrations for generations. “When our client said ‘give me a roof that I will never have to replace,’ we thought metal immediately,” said Nathan Kipnis, AIA. 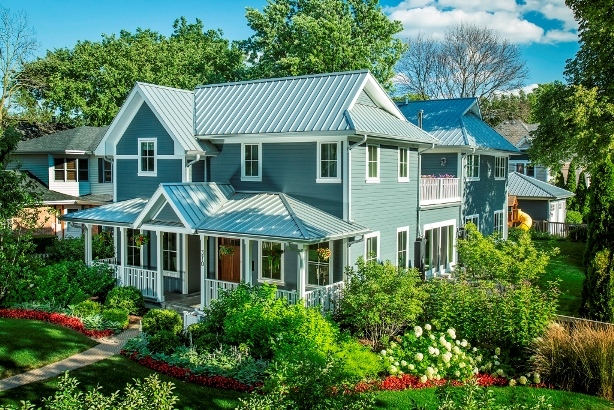 Stateside, a new LEED Platinum home in Glencoe, IL, features an unusual look for a LEED home—traditional rather than modernist design, allowing the home to complement its neighborhood. The standing seam metal roof was a key element of the sustainable design. 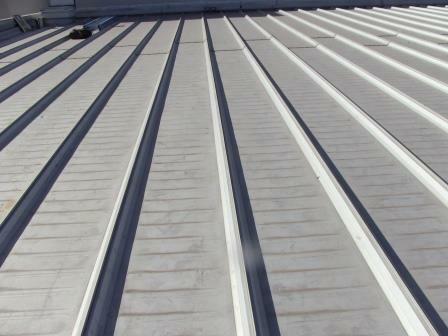 About 600 sq ft of 24-gauge PAC-CLAD material from Petersen Aluminum, Elk Grove Village, IL was used. The Silver Metallic Kynar 500 coating offers high reflectivity and SRI (solar reflectance index) ratings and is Energy Star approved. The roof provides many green features. Its shape is asymmetrically arranged to collect as much storm water as possible. It is also sloped at two different angles—a summer and a winter angle. The steeper, south facing roof supports solar thermal panels, which are optimal for the low winter sun. The shallower south facing section of the roof includes solar PV panels, which maximize electrical production during hot summer days. “When our client said ‘give me a roof that I will never have to replace,’ we thought metal immediately,” said Nathan Kipnis, AIA, principal of Kipnis Architecture and Planning, Evanston, IL. 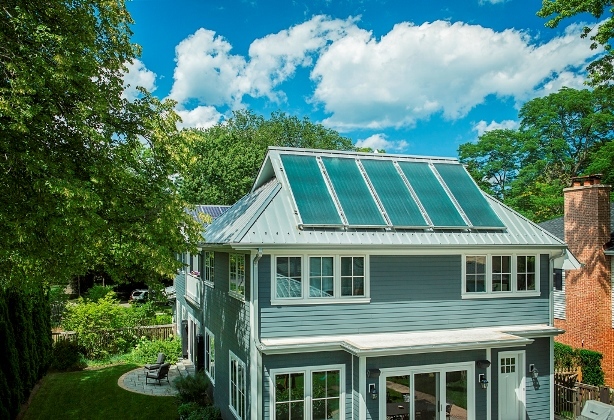 Meanwhile, general contractor, Scott Simpson, president of Scott Simpson Builders in Northbrook, IL, says that, beyond this project, he recently used an old metal barn roof on the interior walls of a renovated—and much beloved—bakery in Evanston.